This super tasty Lax Pudding is undoubtedly one of the most flavorful one-pot meals that everyone should try at least once. Not only is it delicious, but it is also incredibly quick and easy to make. The dish is packed with healthy salmon and fresh dill, (we recommend staying away from dried dill, as it won't give the dish the same flavor) potatoes, eggs, cream and milk. And while the melted butter may not make this dish as healthy as it could be, it sure makes it taste good! 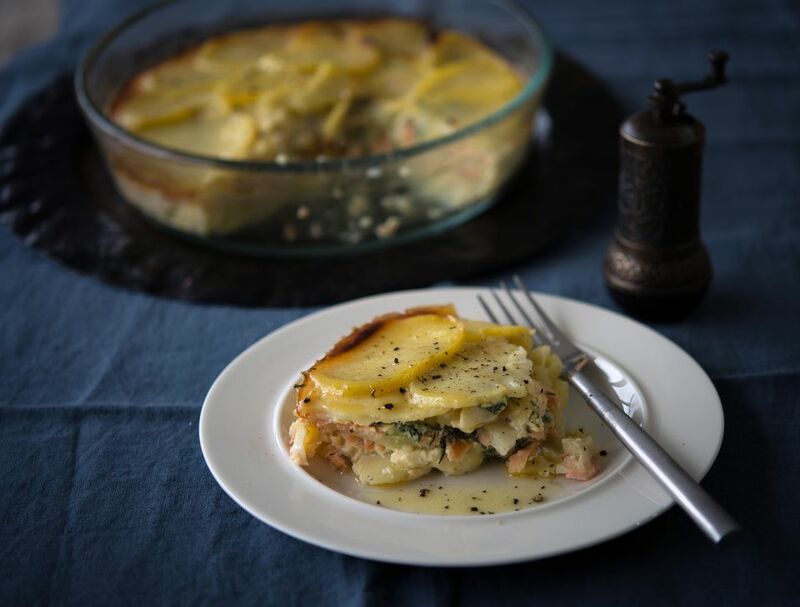 This Lax Pudding makes a delicious mid-week supper dish, a great lunch-box alternative, or an excellent dish for a buffet table. Whichever way you happen to take this Lax Pudding, we're certain you'll be coming back for second helpings! Before you start, preheat the oven to 320 F /160 C /gas 2 1/2 and grease an 8 inch/20cm deep baking dish (preferably round). Evenly slice the potatoes with either a sharp knife or mandolin to approximately 1/4-inch (1/2 cm.). Put the slices into a large pan and season with a little salt and cover with cold water. Bring to a boil, then lower the heat and let simmer for 5 minutes. Strain through a colander, then rinse the potato slices under cold running water and pat dry with a paper towel, taking care not to break them up. Whisk the eggs, milk, and cream in a large bowl enough to incorporate, but do not make too frothy. Add a pinch of salt, and a pinch of freshly ground black pepper, then lightly whisk again. Layer a third of the potato rounds onto the base of the dish, followed by a layer of smoked salmon slices, then sprinkle evenly with chopped dill. Repeat and finish with a layer of potatoes on the top. Pour the egg and cream mixture over the dish, taking care not to disturb the potato and salmon layers. Finish by brushing with melted butter and a good grind of black pepper. Bake the pudding in the center of the preheated oven for 40 minutes, or until the potatoes are browned and the custard set. You can test this by inserting a knife into the pudding, and it should be dry when pulled out. If not, cook a little longer, but cover with foil if the potatoes are browning too quickly. Leave the pudding to stand for 10 minutes before serving with a little more melted butter poured over and a green salad on the side. The pudding can be made the day before and left in the refrigerator overnight. To reheat, cover with foil and put into a medium hot oven (300F/150F/ gas 2) until heated right through to the center. Smoked salmon is the best fish to use for this specific recipe, however you could ring the changes by using Gravlax and omitting the fresh dill. Gravlax gives a slightly oilier finish to the dish though, but it will still taste fantastic!